On Saturday 7 November, the day before Remembrance Sunday, Hereford FC will entertain Rocester in the Midland Football League at Edgar Street. 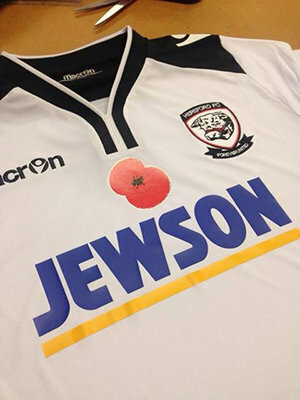 As a mark of respect, and to show support for the Royal British Legionâ€™s Poppy Appeal, the players will be wearing a special set of playing shirts on the day that have a poppy printed on the chest, just above the logo of our main sponsor, Jewson. These shirts are a one off and each player will then sign their shirt after the game. Once signed, club kitman, Roger Lloyd, will collect all the shirts together and each one will be auctioned online in the next few weeks, with all the money raised being donated to the Poppy Appeal in Herefordshire. â€˜As a club were very keen to show support for the Royal British Legionâ€™s Poppy Appeal in the county and this seems a fantastic way of doing this. â€˜It also gives our supporters an opportunity to secure a unique piece of Hereford FC memorabilia as these shirts will be worn only once and each one will be signed by the player who wears it on the day. â€˜In the days after the game the shirts will then be placed on EBay and each will be sold to the highest bidder. â€˜We feel it is vital this club makes a contribution within the local community and therefore every single penny that is successfully bid for each shirt will be donated to support the Poppy Appeal in Herefordshire. â€˜As covering Community Fundraiser for Herefordshire, it is great to see the lengths that people will go to, to support The Royal British Legion. â€˜Hereford Football Club has been a pleasure to work with and I would like to personally thank the club for supporting Herefordshire in their Poppy Appeal for 2015/16. As well as wearing the limited edition shirts during the Rocester game, the Territorial Army have been invited to join the Guard of Honour as the teams take to the field on Saturday 7 November. In addition, on Tuesday 10 November, when Hereford FC entertain Stourport at Edgar Street, the Royal British Legion will be holding a bucket collection to further assist with their fundraising efforts. Good idea and nice to see Hereford doing well again.